Ensure the safety of your grill early so that you can enjoy many long years of outdoor cooking. 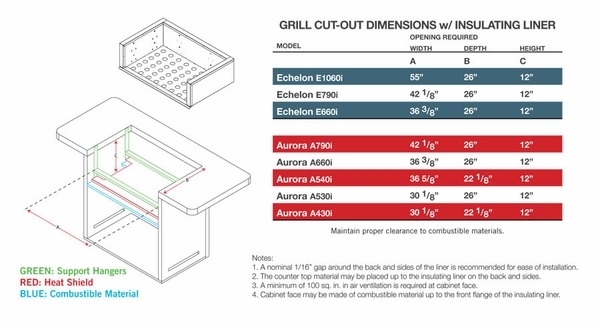 If your grill is going to be installed in a wooden structure or a structure made of any other combustible materials, the installation must include an insulating liner to protect against accidental fires that might be caused by the intense heat that grills produce. This Echelon model by Fire Magic requires a brick opening of 55" W x 26" deep (front to back) x 12.5" H.